Our expertise in Integrated Services Portfolio offers every single service you could need to operate a LEED facility post-construction. Our uncanny ability to create a holistic approach to building maintenance and operations is unrivaled. The only service we don’t provide is security guards. Many clients choose to utilize our entire portfolio instead of hiring a property management company. 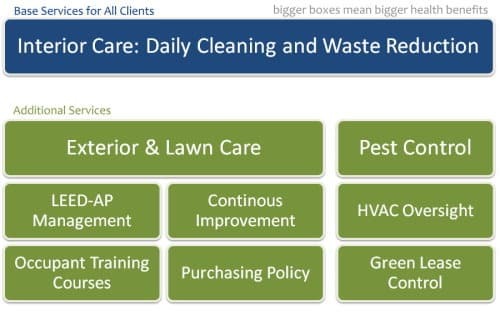 Our green property management clients utilize our entire services portfolio to allow their property managers to focus on more properties.